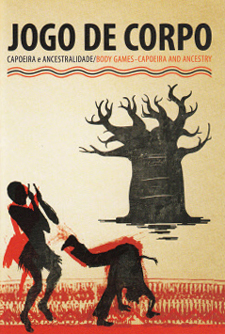 The documentary film Body Games, Capoeira and Ancestry (2014) is one of the major outcomes of the research project. The project The Angolan Roots of Capoeira: Transatlantic Links of a Globalised Performing Art explored the transatlantic links between the Afro-Brazilian martial art capoeira and combat games in Southern Angola. An extended period of civil war made it difficult to carry out fieldwork in the interior of Angola until 2003. The research aims both to fill a significant gap in scholarship and disseminate its outcomes to the wider public through a documentary and publications. The project was funded by the Arts and Humanities Research Council (AHRC) from 2010 to 2013, with additional funding for the documentary's postproduction raised through a successful indiegogo crowd funding campaign. The documentary Body Games - Capoeira and Ancestry is one of the major outcomes of the research project and was completed in November 2013. It has been shown at many documentary film festivals in Africa, Europe, and the Americas throughout 2014 and 2015. The film is co-directed by Richard Pakleppa, Professor Matthias Röhrig Assunção and capoeira master Cobra Mansa, and follows Cobra Mansa and the team on travels through Angola and Brazil in search of the historical roots of his art. The journey explores deeper connections between slavery, identity and society. 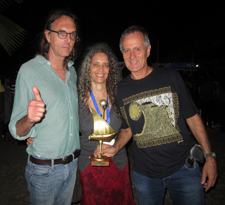 Members of Body Games' production team celebrate winning the Ousmane Sembene Development Film Award at the Zanzibar International Film Festival. For further information please contact Belinda Waterman. Ousmane Sembene Development Film Award, Zanzibar International Film Festival, June 2014. 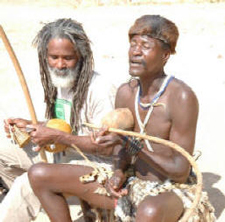 Dialogue of musical bows: Capoeira Mestre Cobra Mansa from Brasil with the berimbau and an Angolan mbulumbumba player Balthazar Tchakota, August 2010. During the nineteenth century African and Creole slaves living in port cities and surrounding plantations in Brazil developed a combat game called capoeira. Even though initially repressed by the authorities, it spread to the free lower classes during the nineteenth century, and to the rest of Brazil during the twentieth century. Capoeira has become one of the most-well known aspects of Brazilian culture and is now widely practiced by hundreds of thousands of people in every continent. Capoeira consists of a combination of acrobatics, rhythms, combat, dance and theatrical performance, all of which maintain a distinctive Afro-Brazilian character. Just how many of its characteristics are 'African' is the object of much debate among capoeira practitioners, academics researching its history, and the wider public interested in the culture of the 'Black Atlantic' or engaged with diasporic issues. Our research explores several traditions in south-western Angola, a region often identified as providing the 'roots' of capoeira because of the existence of instruments and movements similar to capoeira. There are several combat games which use alternatively kicks, hands, sticks and other weapons, techniques that are also present in historical capoeira styles. The project explores the music and lyrics that accompany these performances, and related dances and rituals practiced in some villages belonging to different ethnic groups of the Nyaneka family in that region. Filmmaker Richard Pakleppa captures daily life in the rural area of Cunene, Angola, August 2010. The Arts and Humanities Research Council (AHRC) funded the project from June 2010 to December 2013. During this period, two fieldwork trips to Angola and one to Brazil were completed by the interdisciplinary team consisting of a historian, an ethnomusicologist, a distinguished Capoeira teacher and a renowned filmmaker. The collected data contributed to the making of the documentary and provides the basis for further scholarly analysis. Ethnographic fieldwork is complemented by a specialist historian who worked in archives in Angola and Portugal. The project aims to assess the extent of continuities, and borrowing, but also of ruptures, changes and re-inventions in order to understand the 'creolization' process through which some specific African traditions merged and developed into something new, original and global. Moreover, the project has employed fieldwork methods which involve people in a transcultural dialogue. For instance, performers in Angola have reacted in uniquely illuminating ways when faced with instruments, movements and music that are linked to their own traditions. Dr Mariana P Candido is specialized in the history of Angola from the seventeenth to the nineteenth centuries. Her current research examines the social and political effects of the transatlantic slave trade in Benguela and its hinterland. More broadly her interests include the history of slavery, forced migration and slave trade, the South Atlantic world, and the African diaspora. She is the author of Fronteras de Esclavización: Esclavitud, Comercio e Identidad en Benguela, 1780-1850 (Colegio de Mexico Press, 2011), An African Slaving Port and the Atlantic World. Benguela and its Hinterland (Cambridge University Press, 2013) and the co-author of Crossing Memories: Slavery and African Diaspora with Ana Lucia Araújo and Paul Lovejoy (Africa World Press, 2011). She is an Assistant Professor at the Department of History at the University of Kansas. Dr Christine Dettmann was the Senior Research Officer of the project until 2013. She now holds a chair in Ethnomusicology at the Hochschule für Musik und Theater München in Germany and continues to be a visiting fellow at the History Department of the University of Essex. The renowned capoeira mestre (master) Cobra Mansa (Cinésio Feliciano Peçanha, graduated mestre in 1984) has been performing and teaching capoeira for the last thirty years. He is the founder and president (1994-2004) of the International Capoeira Angola Foundation, an NGO based in Washington, DC, with a dozen affiliated groups in Brazil, the US, and Europe. Mestre Cobra Mansa holds a degree in physical education and has researched movements, music, lyrics and instruments of capoeira for many years. He is a well-known and highly-respected teacher of capoeira across the world and has given many workshops and talks in the US, Western Europe, Russia, Japan, and Latin America. He worked as a consultant for Mandinga in Manhattan (2005), a documentary about the globalisation of capoeira, and has performed as a leading musician on Audio-CDs of capoeira music. He also links permaculture to Capoeira Angola in his communal project Permangola in Bahia, Brazil. Richard Pakleppa is an independent filmmaker. He was awarded a Degree in African Studies, University of Cape Town for a thesis on performance culture, political struggle and identity in the townships of Cape Town, 1983-86. Since 1990 he has made films incorporating oral history and storytelling in Namibia, South Africa and Angola. The documentary Angola, saudades from the one who loves you (2005) won best documentary award at the Three Continents Film Festival; at the Durban International film festival and at the Munich Documentary Film Festival. Land, Fire and Water (2009) gives voice to the San communities in southern Angola. Project co-investigator, Dr Mariana Candido (University of Kansas) has published various articles and books about the history of the slave trade, focusing on the relationship between the Angolan port Benguela and Brazilian ports. With the financial support of this project, her fieldwork and research has led her to Portugal and Angola too. 'Slave Trade and New Identities in Benguela, c. 1700-1860’, Portuguese Studies Review', 19, 1-2 (2011), pp. 43-59. 'Dona Aguida Gonçalves marchange à Benguela à la fin du XVIII siécle', Brésil(s).Sciences humaines et sociales, 1 (2012), pp. 33-54. 'Marriage, Concubinage, and Slavery in Benguela, ca.1750-1850', in Slavery and Africa and the Caribbean: A History of Enslavement and Identity since the 18th century, eds. Nadine Hunt and Olatunji Ojo (London, New York, I.B. Tauris, 2012). 'History and Memory in Capoeira Lyrics from Bahi, Brazil', (.pdf), in N Priscilla Naro, R Sansi-Rosa and DH Treece (eds), (New Yor: Palgrave, 2007), Cultures of the Lusophone Black Atlantic, 199-218. Jogo de Corpo. Capoeira e Ancestralidade / Body Games. Capoeira and Ancestry. Documentary Film, 87 mins. Nyaneka/Portuguese, Portuguese and English subtitles. The DVD is now available for sale. Our academic staff are internationally recognised for their expertise across a range of areas in history. Find out more about their research interests by reading their staff profiles. Watch a taster lecture, hear our students’ opinions of their study experience and see our staff talking about their latest research. Our videos will show you the passion and enthusiasm that we offer. We are a leading centre for history postgraduate study at both Masters and PhD level. Become part of our active research community and benefit from the expert teaching and supervision of our academic staff. Apply for a PhD studentship for your doctoral study funded by the Consortium for Humanities and the Arts South-East England (CHASE) and the Arts and Humanities Research Council (AHRC).